If you search your ancestors in Maschito, Basilicata, info about your Italian family are stored in the City Office archives or at the parishes. In towns and villages of Basilicata and in Potenza province registry offices were established in early 1800: it means that you could find information in Maschito registrar as of that date. So, if your ancestors were in Maschito in the nineteenth or twentieth century, then you could try to contact the City Office of Maschito to know more. Before to start your genealogy research in Maschito, we suggest you to read our tips for your search . They are useful to search in Basilicata and in Maschito too. 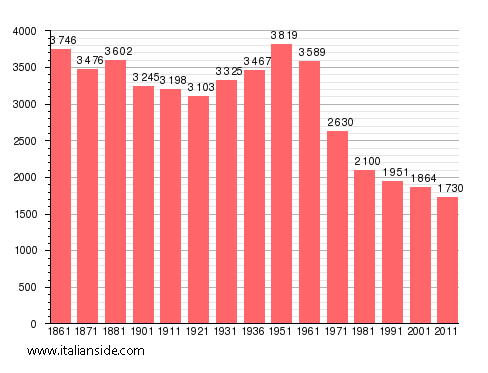 Next picture shows the demographic trends in Maschito from the Italian Unification (1861) an important info to understand how many people lived there in the past. It could be important to know if the last name you are investigating is a frequent surname in Maschito. As more your surname is common in Maschito, as more it could be difficult to find the right info about your ancestors in Maschito archives if you have not exact dates. If you have the opportunity to visit Maschito and Potenza province, you could plan to investigate churches’ archives by yourself, but from abroad is very difficult to obtain any result unless you find a reliable local help. If your research is in a dead end and you need professional help from our local Italian genealogists write to maschito@italianside.com our expert in Maschito area will study your request and will reply to you with a research plan and a quote. Hello- my name is Mary De Luca. I am curious if there are still some De Lucas in Maschito? My grandfather was Joseph Eli De Luca, his father was Thomas C De Luca, and his father was Giuseppe JE De Luca. There is some Cagni and Occhinero married into the family. I’d love to know some more about Thomas and Giuseppe. My understanding was Thomas and his brother were like some kind of city officials. Any information would be great. Thank you very much. My great grandfather was named Pasquale Minichiello and he was from Maschito Italy. His oldest daughter Rosario (Rose) was my grandmother. They came to America in the early 1900’s when my grandmother was 15 years old. Pasquale went back to Italy and never returned to America. He remarried and more children. I did get to meet my grandmothers sister Anna Maria who lived in Venosa about 21 years ago. I am returning to Venosa and Maschito in August this year. I too have the same grandparents names! They settled in NH after arriving in Ellis Island. Would u like to contact me? Looking for information on my grandfather, Joseph Ochinero, born 1897, Had a brother named Tony. I have a Savino Occhionero and Rosa Posca who were married in my genealogy. Born April 1811. Not sure if they are related to your relative. I will look and see if I can find out more information. I am looking for information (birth certificates or info on parents ands relatives) about my great grandparents who are both from Maschito. They immigrated to the USA in 1893 or 1897. Any info would be very helpful! Thanks! Hello, I learned that my grandparents emigrated to the US from Mashito in 1910. Their last name was “Ferramisco” which was shortened to “Feramisco” in the US. They settled in Fresno, California. I am wondering if there are still Ferramiscos in Mashito today. Thanks! Anthony Musacchio was my father and his father Camio Musacchio (1882-1944) was born in Potenza. We are looking for any information about the Musacchio family for our history project. I’m a musto my grandfather came to the United States in 1911 his name like myself is alfonso. I live in Florida .my grandma musto was Creise first name lucy.and they lived in greenpoint Brooklyn .a lot of similarities. Your grandmother, Lucy Criesi, was a sister of my grandfather, Giuseppe Criesi. We all lived in Greenpoint, Brooklyn. Lucy had 5 siblings: Giuseppe (1879-1959), Donato (1882-1929), Michele (1886), Rose (1895-1926) and Maria(1901-1976). I remember visiting them. We called Alphonse “Uncle Funzie”. They had 7 children: Elizabeth (Betty) born in 1916. I remember her well as after we moved to Bellerose, she moved down the block. She married Michael Codianne. Then there was Michael (1917-1993), Anna (1918), Grace (1919), Pasquale (1922-1998), Joseph (1925-1984), and Alphonse,Jr. (1929-2005). Hope this helps. Hi Betty, my grandfather was Donate Criesi! He passed away in Fresno, California in June 1929. I had no clue about his siblings or what their names were. I was so excited to read your comment. Do you have any photos? I would be so happy if you could share any other information you may have about the Criesi family with me. great-grandparents. My grandfather was their son, Joseph(1878-1959). My grandmother was Elisabetta Rafti. My childhood was spent mainly in Brooklyn, but we moved to Florida in 1972. Thanks so much for contacting me, I’ve been working on this for almost 15 years and it’s really great to hear from a “long-lost” relative. Thank you for posting that information! I am a granddaughter of Lucia Criesi and also daughter of Joseph Musto (1925-1984) who you mention above. I was searching for the internet for answers after recently matching with a cousin on Ancestry that I do not know. Her last name is Criesi as well (daughter of Donato, Lucy’s brother). You seem to know a lot about our Ancestry, I am hoping to learn more. Do you have a family tree or anymore information? I currently live in Tampa, was born in New York. Looks like we both started out in Brooklyn and both ended up in Florida. Your grandmother, Lucy, (I still have some memories of her and “Uncle Funzie”- though they have dimmed with time) was the sister of my grandfather, Joseph. My mother, Josephine, was his daughter. We all lived in Greenpoint and saw each other often. When we left Brooklyn, we moved to Bellerose and your father’s sister Elizabeth (Betty) and her husband Mike and daughter Dolores moved down the block from us. It was great living there. I did create a family tree but it’s not posted online. Did you know that many of the people in Maschito were originally from Albania? That explained the strange dialect they spoke. Other Italians in Brooklyn couldn’t understand them. My great grandparents came to America from Maschito in the late 1900’s. They lived in Beacon and Onita New York before moving to Fresno, California. Vincenzo Marchese my great grandfather married Antoinette Giuralarocca. They had seven boys, my father being the youngest. Your great grandmother Antoninette was my great grandmother’s older sister. My great grandmother was Teresa(1871-1949). Rosa lived with my grandmother’s family in Brooklyn. According to her death record her parents were Elia Romano and Anna Maria Loroina . 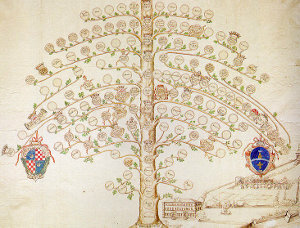 According to a handwritten family tree Rosa was married to 3 different LaRoccas. These are the children listed on the tree. I believe there were more children from a first marriage. Your grandparents are on my family tree. Your dad’s father was Savino Giuralarocca. His mother was Domenica Romano, both born in Maschito. Their other children, as far as I know, were Angelo, Giovanni, spouse’s name is Grazia Barbano, Giuseppe, married to Domenica Dichirica, Elisabetta, married to Donato Criesi. Your mom’s parents were Michael Musto and Elisabetta Vernava, also from Maschtio. My great-grandmother was Anna Giuralarocca and my grandfather’s brother was Donato Criesi, who married your dad’s sister, Elisabetta. My grandfather’s sister, Lucia (Lucy) married Alphonse Musto so I guess we’re all related. Hope this helps. My Grandparents came from Maschito in early 1900’s to the U S. Their names are Anthony Paladino & Delia Tarantino. My Grandfather came over with his Brother Michael. He had a sister Angela who married a Romano. Any records would help me out in finding more about them & any relatives if any are still living there. Hello! My great-grandfathers name was Luigi Carmen Grieco. He was born on 07 Dec 1893 in Moschito Italy. I’m hoping to obtain his birth certificate from Moschito, but am not quiet sure where to start. I would be grateful for any information pertaining him! Endless thanks and happy holidays! This happens to be the info of my grandfather. We are in the central valley of California. He had two sisters as well. Ciesco family in Maschito. Carmine. Had 8children. Only one is alive now that is my father Attanasio who was the last born in 1929 in Maschito. Be interesting to find out more history information. My great grandfather is Eligio Ciesco born and raised in Maschito Italy born in 1875 came to USA 1895 to Brooklyn, NY they migrated to Torrington, Ct. My grandfather Gerado Ciesco was the oldest of 7 brothers and sisters. My wife lived near the Amilfi Coast for 30 years we go to Italy often because her family still lives there. We have visted Maschito 3 years ago and at that time there where 7 Ciesco families still there. If possible I would love to talk with you I have birth certitficate of my great grandfather Eligio and my grandfather Gerado. Recently found out that my grandfather, Pasquale Minichiello, came to America in 1906 from Maschito to Naples to America. Wonder if there is any info on that name in Maschito? per piacere per l`ufficio anagrafe : mi serve un certificato di nascita che dice : Volpe Vincenzo nato il 4/11/1952 …moltissime grazie antipacitamente !!! perche ? nel mio passaporto dice che sono nato a Chieri provincia di Torino !!! I am looking for information on my grandfather. His name was Giuseppe (Joseph) Mazzei and he came to the US via Ellis Island around 1908. Some time around 1912 our last name got changed to Mazzeo. I was hoping to find more family info including the village he came from in the region. Hello Patrick, are you the brother of Carole and Linda? This is Jeff, husband of Carole asking. We’re here in Fresno with dad/Joe. I just received an email with the correct spelling of my grandmother’s name. Elisabetta Masucci who was born in 1882. the email also reports that my grandfather was not born in Maschito but my mother told me he was. I would appreciate any help you can give me. Thanks so much. I have in my tree Anna María Masucci born in 1803 in Machito. Can you please tell me how I could possibly find the birth certificate for my grandfather? His name is Carmen Musacchio and was born about 1878. His wife was Elizabeth who was born in about 1881. They both were born in Maschito. I would greatly appreciate any direction you can give me. Thanks so much. My family migrated to nyc in early 1900s my mom benvenuto and my Dad Musacchio both came from Maschito. Live on long island until their death. Would love to know more about the legend of Muzaki royal family of Albania until they escaped to Falconara in early 1400s…settled in maschito.turks arracjed and conquered them. Looking for information of my grandfather. His name, Rocco James Giglio. He was born in Maschito Potenza Basilicata Italy June 20, 1881. He came to America from Naples to Ellis Island when he was 25 years old. He went to live with someone in Patterson New Jersey. His fathers name was Joseph Giglio and his mothers name was Martha Telesco. Any information would be appreciated. I am looking for the marriage record of Agostino Sinerchio and Rosa Marie Jura that were believed to be married at Chiesa di Sant’Elia probably in 1890’s. Maternal surname was Summa. Any records pertaining to either side of this family would be helpful. Thank you. My granfather’s name was Francisco Cammarota. he had A brother Mike and a sister Geniife. He was born about 1878. he did have siblings who did not come to America. He married while in Moschito and had a child Vincenzia. When he came to America, his wife died and he remarried. his wife was my grandmother. I visited Moschito three years ago. the City Hall was closed and I was unable to obtain ny informtion. I would be grateful for any information regarding relatives. I was thrilled to be in the village my dear grandfather came from. If you would like to start a research in Maschito please send your request to maschito@italianside.com.